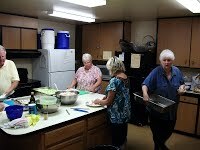 The first Wednesday of every month a hot meal is prepared and served in our fellowship hall to the homeless or people that are struggling to get by. A total of five area-wide churches, including Christ Lutheran, alternate serving the meals that are served from 5:00 pm to 6:30 pm. The number of people served varies, but there usually are between 50 and 140 dinner guests. 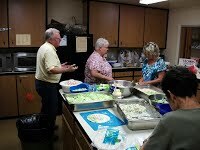 As many as 25 volunteers are welcome to help in all phases of set-up, food preparation, serving, and clean-up. If you would like to make a monetary donation, please make check payable to Christ Lutheran Church and mark on it “For Community Meal.” It can be put in the offering plate or mailed to the church office. Contact Morrie Mabbitt for additional information.